For Neil Brown, a love of greyhound racing came naturally. After all, growing up within walking distance – albeit a long walk – from Sandown Park made attending Thursday night races a perfect pastime. Brown, the current chairman of the Sandown Greyhound Racing Club – among many other roles – has been involved with greyhound racing for 50 years and was recently awarded the Ken Carr Medal at the 2017/18 Victorian Greyhound Awards. 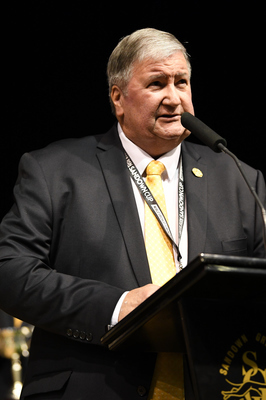 The Ken Carr Medal – named in honour of the late Ken Carr, a legendary Victorian greyhound racing administrator – is considered the highest award for excellence within the Victorian greyhound racing industry. Completely humbled by the award, Brown reflected on his journey within the sport. “The awards are not something you even think about or look for. I’ve been involved since I was a teenager and it was 1968 when I started going regularly and I’ve dabbled into everything you possibly could in regards to the greyhounds, so I haven’t left any stone unturned,” he said. Brown’s love for greyhound racing began when he as lining up for football finals tickets. “I was about 16 and was waiting overnight at the MCG for football finals tickets and someone said you can have your spot saved in the queue by other people and have a couple of hours off,” he said. “A friend of mine said we should go across to Olympic Park to watch the greyhounds and I sort of fell in love with it from there. “I grew up in Springvale, so it was a natural progression to go to Sandown Park which was virtually within walking distance of my home. It’s fair to say Brown has repaid the club for those free entries back in the day, with his tireless work having helped drive greyhound racing at Sandown – and nationally for that matter – to great heights. Brown’s work on ensuring the proud history of the sport is saved for generations to come has been tremendous. “I really took to the historic side of it and I’ve tried to maintain it and preserve it,” he said. Having seen some of the very best dogs that have ever raced, there are two who stand out in Brown’s mind as the best he’s witnessed. “I’ve always maintained, up until probably the last year and a half, that Zoom Top – who raced in the late 1960s to early 1970s – was the best I’d ever seen and her records speak for that,” he said. Having been in the industry for 50 years, is Brown considering slowing down? There’s no doubt that greyhound racing is greater for Neil Brown’s involvement and the Ken Carr Medal is recognition of half a century of dedicated service to the sport.